We may have cowboy boots on, but do you live in a barn? Yesterday I went to the Kenny Chesney concert at the Meadowlands Stadium. I don’t know why the NYC metro area does not have a country radio station, but the stadium was packed and it’s clear there are loads of fans, myself included. Of course there were the requisite fans, those who had been drinking all day and were to the point of total and utter obnoxiousness, pushing and screaming their way through crowds of people. And then there were the subtly obnoxious fans…more specifically, the girl who sat in front of my friend and I…in our first of three seats. First, when she wanted to cut through our row to get to her seat, in the row below, she did not say excuse me, she just sort of barged through the area pushing and shoving into anyone in her way. Is this a barn? Are you a wild animal? Am I showing my age? The kicker, which started as soon as she sat down, was that she used the stairs as her personal coffee table. 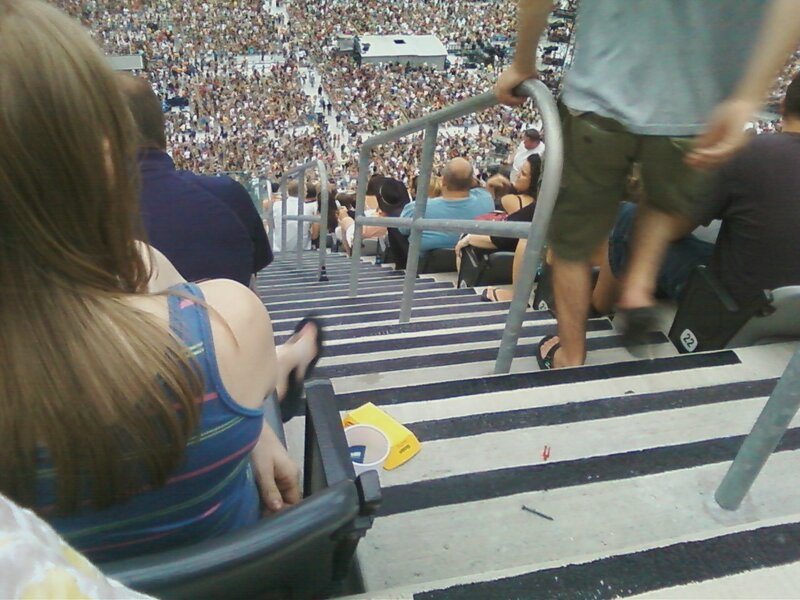 She had her beer, her phone, her sunglasses, and later, her fries, all laid out on the stairs. Where people walked. We wanted to tell her that sunglasses belong on your head, your phone in your purse, the beer fits in the handy-dandy uber-convenient cup holder in front of you and your empty thing of fries goes in the trash. Really? Here’s a photo. I was about to take the picture to document her obnoxiousness with all of her stuff laid out on the stairs. But it turned into an action shot as the guy in the green shorts just kicked over the fries when he had to zig zag around her personal table. I believe the phone and/or the sunglasses landed on the step below. ps – Awesome concert. Even with this girl and the rain (which managed to be the heaviest part of the downpour just as the Zac Brown Band finished up and they were setting up for Kenny), it was incredible. If you have never seen Kenny Chesney live, you have no idea what you are missing. Country fan or not, he puts on such a great show. This entry was posted on Sunday, August 14th, 2011 at 12:00 pm	and posted in in and around NYC, observations, why. You can follow any responses to this entry through the RSS 2.0 feed.